The NIH identified that most microbial infections are biofilm-associated. Bacterial biofilm formation in human infection is of great concern to public health, as it has been associated with increased antimicrobial resistance, decreased effectiveness of host response, chronicity of infection, and medical device-associated disease. The pathogen, methicillin-resistant Staphylococcus aureus (MRSA), warrants special attention since it has been a frequent culprit in hospital- and community-acquired infections, is known to form biofilms in vivo, and is notoriously resistant to antimicrobics. This study sought to inhibit biofilm formation and/or reduce MRSA viability using the phytochemical cinnamaldehyde, which has been widely studied as an antimicrobial agent as well as a quorum sensing inhibitor. Clinical MRSA isolates from area hospital laboratories were assessed for cinnamaldehyde effect using a: (i) microplate assay for quantitative spectrophotometric evaluation of crystal violet-stained biofilm adherent to microwells; and (ii) viable bacterial count assay for colony forming unit (CFU/ml) enumeration. Results indicated that cinnamaldehyde inhibited MRSA biofilm formation in a concentration-dependent manner with significance (p<0.01) at 50 and 100 μM. Colony counts of MRSA were also significantly (p<0.01) reduced in a concentration-dependent manner. Taken together, these results indicate that cinnamaldehyde inhibits MRSA biofilm formation at early time points and reduces cell viability. 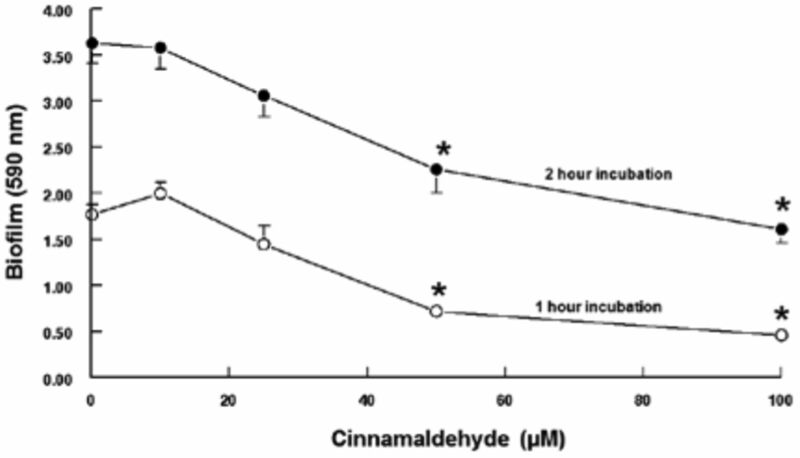 Since an early effect of cinnamaldehyde was noted in this study, in the future, expanded kinetic studies will be assessed to ascertain cinnamaldehyde effects at the different steps of biofilm formation. Biofilm-associated infections have taken a large toll on public health. Indeed, it has been identified that 80% of all chronic infections and 65% of all microbial infections are biofilm-associated.1 One of the most debilitating aspects of biofilm formation is the resulting high level of resistance to antimicrobial treatment, presumably due to biofilm structures protecting bacteria in the biomass, the presence of persister cells that have become metabolically inert and the fact that the mechanism of action of many antimicrobic agents focuses on actively replicating (rather than inert) bacteria. Not only does antimicrobic resistance hinder the immediate elimination of infection, but it leads to disease recurrence as well. One of the best documented examples of biofilm-mediated recurrence is that which occurs in cystic fibrosis-associated lung infection.2-4 Thus, the critical role that biofilm formation plays in virulence and progression of infection reflects a need for advancement in knowledge of bacterial biofilms and their effects on treatment. Infections resulting in biofilm formation that warrant special attention are those due to methicillin-resistant Staphylococcus aureus (MRSA). Historically, MRSA infection was rarely seen outside of the hospital setting and was therefore called “hospital-acquired” MRSA. Even at that time, it was observed that these infections were especially problematic with patients who received surgical implants, such as heart valve replacements and pacemakers.5 Later a large concern to public health manifested when the number of recorded “community-acquired” infections greatly increased, giving rise to the term “community-acquired methicillin-resistant Staphylococcus aureus” (CA-MRSA).6 Subsequently, MRSA infections displayed antimicrobial resistance surpassing β-lactam antibiotics7 and a defining characteristic of MRSA virulence included resistance to agents in other classes of antibiotics like vancomycin thereby causing this organism to become known as “multidrug-resistant Staphylococcus aureus” (MDR-MRSA or MRSA). Because of this dramatic increase in antimicrobic resistance in a relatively short period of time, researchers initiated studies to understand this increased resistance while pharmaceutical companies increased efforts to identify new classes of antimicrobic agents. The study herein reported seeks to better understand biofilm as a mechanism of antimicrobic resistance and study a phytochemical that has anti-biofilm and anti-MRSA effects. The phytochemical identified to have anti-biofilm and anti-MRSA effects is cinnamaldehyde, a volatile phenol that comprises the majority of essential oil extracted from the bark of trees of the genus Cinnamomum. Cinnamaldehyde has been known to have broad-spectrum antimicrobial properties.8 Because of its antimicrobial properties, the hypothesis was formulated that cinnamaldehyde has anti-biofilm properties when applied to pathogens such as MRSA. 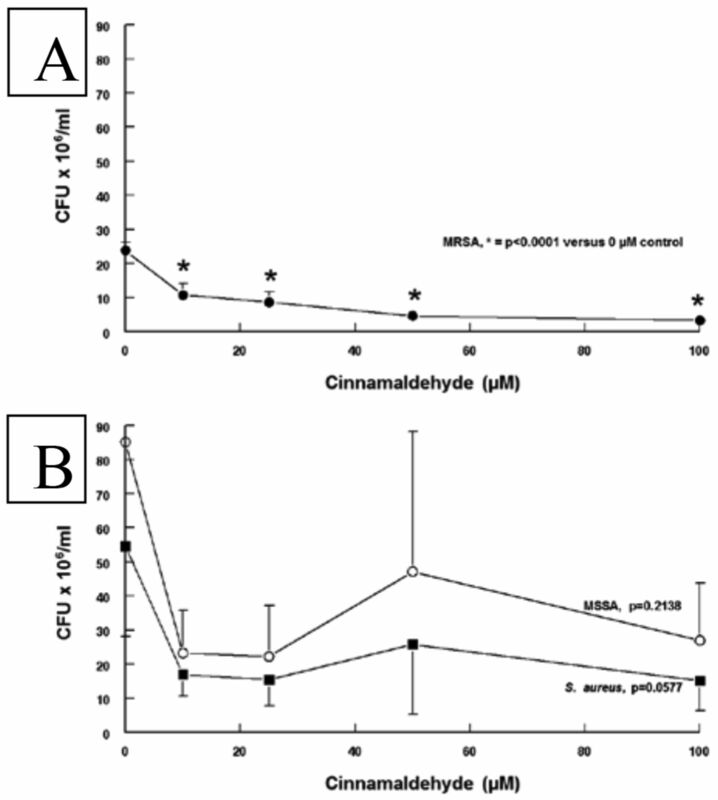 Indeed, studies are being reported that cinnamaldehyde has anti-biofilm potential in E. coli,9 S. aureus (not specified as MRSA)11 and S. aureus identified as MRSA but using different methods from those herein reported.10 The current study confirms that cinnamaldehyde inhibits biofilm formation in MRSA obtained from clinical isolates and expands on current reports by determining viable bacterial count (CFU/ml) after cinnamaldehyde treatment, thereby defining its antimicrobic effect. Methicillin-resistant Staphylococcus aureus (MRSA) and methicillin-susceptible Staphylococcus aureus (MSSA) (4 strains of each) were obtained from local area hospitals and identified and susceptibility confirmed by methods currently employed in clinical laboratories. Bacteria were cultured onto agar media and isolated colonies were suspended in sterile tryptic soy broth (TSB) and incubated (overnight, 37°C). Bacterial suspensions were diluted with TSB to obtain standardized turbidities (A590 of 0.2-0.25) and then dispensed as equivalent cell numbers into wells of polystyrene, U-bottom, 96-well microplates (Midwest Scientific, St. Louis, MO) for biofilm quantitation. Microplates containing standardized inoculum (100 μl, A590 of 0.2-0.25) were incubated (37°C, 1 h or 2 h) after which time, the bacteria were killed by glutaraldehyde treatment (10 μL of 11%, 15 min rotation, 23°C). Nonadherent microwell contents were removed by aspiration and microwells were washed twice with distilled water. Microplates were air-dried overnight at room temperature. Biofilm was stained with aqueous crystal violet (0.1%, 200 μL, 15 min rotation, 23°C) and excess crystal violet was removed by aspiration and two washes using distilled water. Plates were again air-dried overnight at room temperature. Stained biofilm was solubilized in 8% acetic acid and stain intensity quantitated spectrophotometrically (A590: Biotek Instruments Inc, Winooski, VT). For this assay, cinnamaldehyde (Sigma Aldrich, St. Louis, MO: 100 mM solubilized in dimethylsulfoxide [DMSO]) was diluted in TSB to final reaction concentrations (0, 10, 25, 50, 100 μM). DMSO served as the vehicle control. For no growth controls, only sterile TSB (125 μL) was dispensed into intended wells. Growth control wells contained standardized amounts of bacteria in TSB (100 μL) plus an additional aliquot of sterile TSB (25 μL) to bring the final volume to 125 μL. For cinnamaldehyde test wells, different concentrations of cinnamaldehyde solubilized in TSB (in a final volume of 25 μL) were dispensed into indicated microwells. Standardized aliquots of bacterial isolate (100 μL) were dispensed into remaining wells of polystyrene, U-bottom 96-well microplates. Microplates were incubated (37°C, 1 h or 2 h) after which time, the bacteria were killed by glutaraldehyde treatment. Biofilm quantitation was determined as per the above defined Biofilm Quantitation Assay. For the quantitation of viable bacteria assay, cinnamaldehyde was diluted in TSB to obtain necessary concentrations. MRSA or MSSA were treated with indicated concentrations (0, 10, 25, 50, 100 μM) of cinnamaldehyde and incubated (37°C, 2 h). A 10-fold dilution scheme was used to dilute each tube for plate counting. Briefly, aliquots (100 μL) from each dilution tube were three-way streaked on tryptic soy agar (TSA) plates and incubated (37°C, overnight). Colonies were counted and colony-forming units per mL (CFU/mL) were determined. Mean±SEM were performed for all cinnamaldehyde concentrations and displayed. One-way ANOVA followed by Tukey post-hoc analyses were performed for comparison studies. Significance was identified at p < 0.05 unless otherwise noted. Given that antimicrobic drug resistance is ever-increasing, identification of alternative, non-traditional antimicrobial agents that can be used to treat bacterial infections is warranted. Many phytochemicals have been identified for anti-bacterial potential, yet the mechanism of action of most of these compounds remains undefined. In this study, we tested the phytochemical cinnamaldehyde for its ability to inhibit biofilm formation and reduce bacterial viability. When MRSA were incubated in the presence of cinnamaldehyde, we found that the cinnamaldehyde inhibited production of biofilm by all MRSA strains tested (Figure 1). Biofilm inhibition was concentration-dependent and significant (p<0.01) inhibition was evident at the 50 and 100 μM concentrations at both time points (1 h, 2 h: Figure 1). Results indicated that cinnamaldehyde inhibited biofilm formation by MRSA in a concentration-dependent manner. When considering the overall mechanism by which cinnamaldehyde accomplished the inhibition of S. aureus biofilm, the question was posed as to viability of MRSA when in the presence of cinnamaldehyde. For this reason, a quantitative viability assay was performed with the measurement of colony-forming units/ml (CFU/ml) as the outcome. It was observed that cinnamaldehyde elicited a concentration-dependent inhibition of MRSA viability with statistical significance (p<0.001 versus the 0 concentration control) evident at 10, 25, 50 and 100 μM concentrations (Figure 2A). For comparison purposes, MRSA and MSSA strains were assessed and an inhibitory effect was evident with MSSA at low concentrations (10 μM, 25 μM); however, the effect was not maintained at higher concentrations (p=0.2138: Figure 2B). For a generalized S. aureus (MRSA and MSSA) effect, cinnamaldehyde inhibited viability of S. aureus at all concentrations tested but none of which showed statistical significance (p=0.0577: Figure 2B). Cinnamaldehyde Inhibits Biofilm Formation by MRSA. Clinical isolates of MRSA were assessed for effect of cinnamaldehyde (at various concentrations: 0 μM, 10 μM, 25 μM, 50 μM, 100 μM) on biofilm formation (37°C, 1 h or 2 h incubation periods). All reactions were performed in triplicate and four strains of MRSA were assessed (n=4). Biofilm was stained, solubilized, assessed spectrophotometrically (A590) and reported as crystal violet-stained biofilm (Biofilm (590 nm)). * = p<0.01 as determined by ANOVA followed by Tukey post hoc analysis. It is herein reported that cinnamaldehyde inhibited biofilm formation of MRSA, probably via the mechanism of reducing bacterial viability since both effects were observed at similar concentrations and kinetics.” Definitely these two are linked (inhibition of biofilm formation and lack of bacterial viability) since biofilm is formed by viable microbial cells and decreased viability would cause an inhibitory effect on biofilm formation. This report herein serves to confirm a prior report10 that cinnamaldehyde acts as a lethal agent against MRSA. It is noteworthy to mention that Jia et al10 utilized minimum inhibitory and bactericidal concentration (MIC and MBC respectively) assays whereas the current results identified an inhibitory effect on biofilm formation that progressed to determination of mechanism of anti-biofilm effect as lack of MRSA viability (determined by a standard CFU/ml viability assay). The current report went on to identify cinnamaldehyde effect on MSSA, which was not as remarkable as the MRSA effect (Figure 2). No significant changes in viability were observed in the MSSA strains (Figure 2), although the possibility exists that some MSSA strains may have been susceptible to cinnamaldehyde-induced lethal effect but other strains of MSSA did not have the same outcome in the presence of cinnamaldehyde. It should be noted that results of Jia et al 10 are similar to those herein displayed; however, methodology used to obtain results were quite different (MBC assay versus CFU/ml assay). It can be concluded that the results of Figure 2 identify that cinnamaldehyde exerted a killing effect on staphylococci, especially MRSA. Effects of Cinnamaldehyde on Viability of S. aureus. Number of colony-forming units/ml (CFU/ml) was determined by serial dilution of bacteria in broth (TSB) followed by cinnamaldehyde addition (0 μM, 10 μM, 25 μM, 50 μM, 100 uM), incubation (2 h, 37°C), plating of broth bacteria (106 and 108) onto agar plates, incubation (overnight, 37°C), and counting of individual colonies that grew. Number of colonies counted in the dilution having countable numbers of bacteria (108 dilution factor) was used for statistical analyses and graphically displayed since the other dilutions had CFU/ml that were too numerous to count (>500 colonies). MRSA results were displayed in Panel A (n=3). MSSA (n=3) and S. aureus (n=6) results were displayed in Panel B. Since cinnamaldehyde has both antimicrobial action as well as quorum sensing inhibition abilities,10 it is plausible that the mechanisms through which these effects were exerted are linked. Since cinnamaldehyde is hydrophobic,8 it may be proposed that this property allows cinnamaldehyde to kill bacteria by infiltrating the cell wall or cell membrane and disrupting its integrity.11,12 If this mechanism is indeed responsible for bactericidal effect, then effects on cell viability and quorum sensing13 may be attributed to the same chemical property. Another possible mechanism by which cinnamaldehyde elicits a lethal effect is inhibition of ATPase activity.12,14 In quorum sensing of Gram positive bacteria, the secreted autoinducer is a peptide that needs to pass through an ATP-dependent channel protein.15 With a lack of ATP, a reduced amount of autoinducer is secreted and quorum sensing ceases. Therefore, it is likely that inhibition of ATPase leads to inhibition of quorum sensing, which then leads to loss of bacterial viability. Interestingly, cinnamaldehyde has been shown to inhibit staphylococcal quorum sensing and that biofilm formation decreased as a result of hindered quorum sensing.10 It has been suggested that cinnamaldehyde inhibits staphylococcal quorum sensing by acting as a competitive inhibitor of the kinase AgrC.13 AgrC has an important autoinducer-binding site that is a hydrophobic pocket.13 Thus, the hydrophobic nature of cinnamaldehyde increases its likelihood of occupying that binding site, inhibiting the kinase, and halting quorum sensing.8 It must be noted, however, that quorum sensing inhibition is not the only way to decrease biofilm formation. To conclude, the spectrophotometric assay for biofilm formation and CFU assay for cell viability showed that cinnamaldehyde is capable of inhibiting biofilm formation and reducing cell viability. Investigating the interaction between cinnamaldehyde bactericidal effect and increased quorum sensing inhibition provides numerous opportunities to delve into the intricacies of cinnamaldehyde mechanisms. Thus, future steps towards determining a mechanism of cell viability reduction is to ascertain the extent to which each mechanism (ATPase activity, hydrophobic effect) affects biofilm formation. Thanks to Dr. Rita Heuertz for mentorship and support throughout this project. The authors acknowledge Mona Hebert for technical assistance. Financial support was received from the DeNardo Education and Research Foundation (to RMH for support of research students), an ASCLS Education and Research Fund grant (to RMH) and the Biomedical Laboratory Science Department at Saint Louis University.
. A review of biofilms produced by pathogenic bacterial. 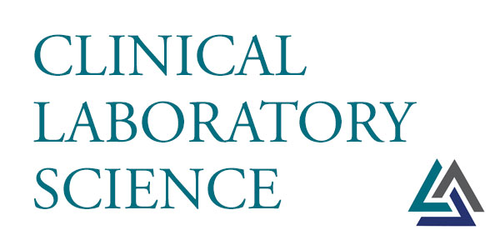 ADVANCE for Med Lab Professionals 2010;22:1-6.
. Pseudomonas aeruginosa biofilms in disease. Microb Ecol 2014;68(1):1-12.
. Review: Staphylococcus aureus and MRSA in cystic fibrosis. J Cyst Fibros 2011;10(5):298-306.
. Bugs, biofilms, and resistance in cystic fibrosis. Respir Care 2009;54(5):628-40.
. hVISA and MRSA endocarditis: an 8-year experience in a tertiary care centre. Clin Microbiol Infect 2014;20(10):O730-6.
. Solonamide B inhibits quorum sensing and reduces Staphylococcus aureus mediated killing of human neutrophils. PLoS One 2014;8;9(1):e84992.
. Recurrent challenges for clinicians: Emergence of methicillin-resistant Staphylococcus aureus, vancomycin resistance, and current treatment options. J Lab Physicians 2013;5(2):71-8.
. Antibacterial effects of cinnamon: From farm to food, cosmetic and pharmaceutical industries. Nutrients 2015;7(9):7729-48.
. Colorimetric method for identifying plant essential oil components that affect biofilm formation and structure. Appl Environ Microbiol 2004;70(12):6951-6.
. Effect of cinnamaldehyde on biofilm formation and sarA expression by methicillin-resistant Staphylococcus aureus. Lett Appl Microbiol 2011;53(4):409-16.
. Biodegradable polymer (PLGA) coatings featuring cinnamaldehyde and carvacrol mitigate biofilm formation. Langmuir 2012;28(39):13993-9.
. Use of multiparameter flow cytometry to determine the effects of monoterpenoids and phenylpropanoids on membrane polarity and permeability in staphylococci and enterococci. Int J Antimicrob Agents 2012;40(3):239-45.
. Hydrophobic interactions drive ligand-receptor recognition for activation and inhibition of staphylococcal quorum sensing. Proc Natl Acad Sci USA 2004;101(46):16168-73.
. Inhibition of membrane bound ATPases of Escherichia coli and Listeria monocytogenes by plant oil aromatics. Int J Food Microbiol 2006;111(2):170-4.
. Quorum sensing in bacteria. Annu Rev Microbiol 2001;55:165-99.